I have placed several orders and every time the orders are perfect. I have never had a problem. And the shipping… I won’t ruin the surprise, but wait til you open the mail. Thank you so much. WOW! Make your own rosary without doing all the work! Beautiful beads in tons of colors, and plenty of crucifix and center choices. Better than ready made rosaries from a religious store or merchant site. I purchased a rosary for my wife as a token of our 16th wedding anniversary (topaz and silver). I was very impressed by the outstanding quality and beauty of the rosary and the excellent promptness of the service proved. This will be my "go to" shop for any similar items in the future. My highest recommendation and compliments! Click below to subscribe to my email list or visit my blog at www.rosarystuff.wordpress.com for information about new items and sales. 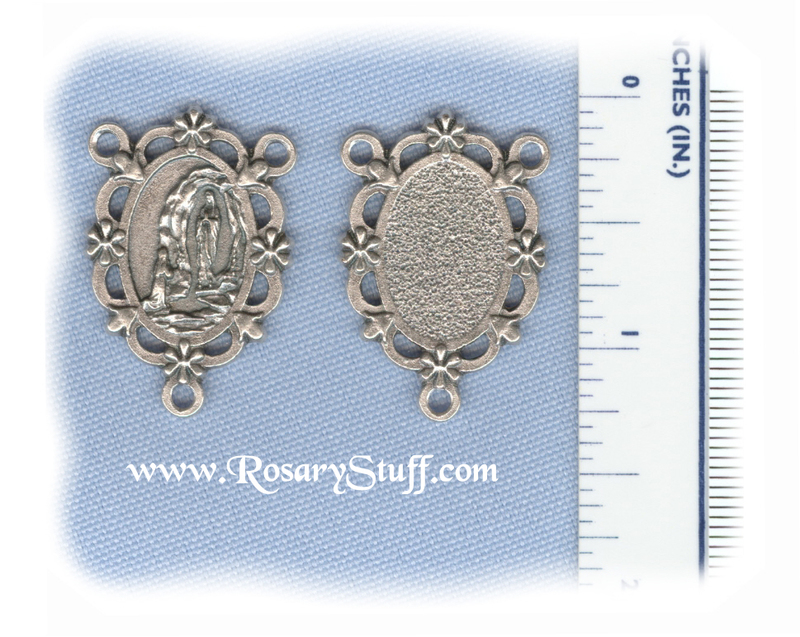 LARGE Italian silver plate Lourdes rosary center with an openwork, floral design. This plain backed center is 1 1/4 inches tall (including bottom ring) by 7/8 inch wide. Lourdes Water Center (Medium) ~SP~ 3/4"
Would you like to see what my customers think or leave your own Feedback? Click on the links below to check out customer ratings and reviews! I'm just kidding, but due to the CPSIA Law passed in 2008 and the government fear that kids and pre-teens will eat their rosaries, my rosaries, parts, and supplies are no longer recommended for children under the age of 13 years. Please click here to learn more about the Consumer Product Safety Improvement Act and how it affects you and your family. Copyright Rosaries by Speziale. All Rights Reserved. eCommerce Software by 3dcart.